I get tons of questions from readers and friends about how to select a good deck contractor. This is an interesting topic worth discussing so that you find a good deck contractor if you decide to hire someone to build yours. Decks are extremely popular today so it seems everyone that doesn’t have one wants to add it to their house wish list. Frankly decks are a great way to increase the value of your home while extending the living space to the outdoors. If you’re thinking about hiring a deck contractor then there are some things you should know before you start the process. First off we need to start with the basics. Before you hire a contractor to do any work on your home you need to do some home work. It’s best to get multiple estimates from at least 3 contractors. Preferably those contractors will all be ones that you’ve received referrals on from family, friends and neighbors. Be sure that you get referrals from people who had an actual deck built so you’re getting an accurate referral. You should be sure that the contractor you hire has proper insurance. If he has employees you’ll want to be sure he has both liability and workers compensation insurance. If he doesn’t have insurance or won’t show you the certificates I highly recommend you look elsewhere. Last but certainly not least is be sure you get detailed written estimates. Written estimates should list all the proposed materials, a proposed schedule, proposed payment schedule and rates for change orders. Contractors that specialize in decks are likely to do it cheaper, quicker and offer more options. Large general contractors or contractors that specialize in framing homes or finish carpentry might not be the best choice for building your deck. While they are more than qualified they likely have more overhead and higher labor costs. I highly suggest trying to hire a deck contractor that spends most of his/her time building decks. 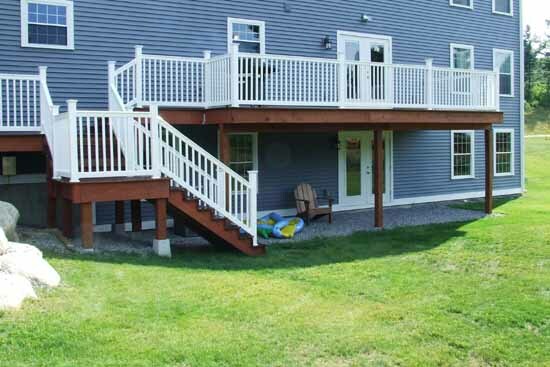 There is such a demand for decks right now that there are plenty of contractors that do nothing but decks. Someone like that will be far more efficient and likely far more knowledgeable on the latest trends in design and materials for decks. One last piece of advice if you’re going to hire a deck contractor to build a new deck. Be sure that all the necessary permits are in place before work begins. Ask your contractor who is pulling the permits. In some cases the contractor will want to do that themselves and in some situations they will want you to deal with the local building code official. A very common mistake with new decks is overlooking local Zoning laws dealing with property setbacks to decks. Be certain that you discuss the proposed location with your local building officials. I’ve seen cases where decks have been torn down because they were too close to a neighbors property line.